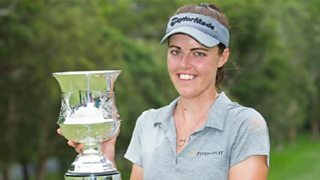 Meghan MacLaren tells BBC Look East working on small details of her game has helped her win a first Ladies European Tour title. The 23-year-old from Northampton has moved up to number 207 in the world rankings and had her father David as her caddie for the final two rounds in Australia. MacLaren's putting coach, Nick Soto, uses the latest technology to analyse her performance on the green.